There has been a lot of (heated) discussion in the past weeks concerning UEFI Secure Boot and how this can impact on the ability of a user to install their operating system of choice. To address this, today has seen no less than two papers published to address this hot topic. Canonical along with Red Hat have published a white paper that describes how UEFI Secure Boot will impact users and manufactures. The paper also provides recommendations on the implementation of UEFI Secure Boot in way that allows users to be in control of their own PC hardware. Meanwhile the Linux Foundation has also published a paper giving technical guidance on how to implement UEFI Secure Boot to allow operating systems other than Windows 8 to operate on new Windows 8 PCs. So lots to read and good technical guidance all round. Let's hope that these constructive set of papers will push the argument into a positive outcome. C vararg macros are very useful and I've generally used them a lot for wrapping C vararg functions. However, at times it would be very useful to be able to determine the number of arguments being passed into the the vararg macro and this is not as straight forward as it first seems. Anyhow, this problem has been asked many times on the usenet and internet, and I stumbled on a very creative solution by Laurent Deniau posted on comp.std.c back in 2006. ..which is appealing as it is more immediately understandable than the PP_NARG() macro, however it is less generic since it only works for ints. Anyhow, it's great to find such novel solutions even if they may be at first a little bit non-intuitive. Resetting CMOS memory on x86 platforms is normally achieved by either removing the CMOS battery or by setting a CMOS clear motherboard jumper in the appropriate position. However, both these methods require access to the motherboard which is time consuming especially when dealing with a laptop or netbook. An alternative method is to twiddle specific bits in the CMOS memory so that the checksum is no longer valid and on the next boot the BIOS detects this and this generally forces a complete CMOS reset. I've read several ways to do this, however the CMOS memory layout varies from machine to machine so some suggested solutions may be unreliable across all platforms. Apart from the Real Time Clock (which writing to won't affect a CMOS reset), the only CMOS addresses to be consistently used across most machines are 0x10 (Floppy Drive Type), 0x2e (CMOS checksum high byte) and 0x2f (CMOS checksum low byte). With this in mind, it seems that the best way to force a CMOS reset is to corrupt the checksum bytes, so my suggested solution is to totally invert each bit of the checksum bytes. To be able to read the contents of CMOS memory we need to write the address of the memory to port 0x70 then delay a small amount of time and then read the contents by reading port 0x71. To write to CMOS memory we again write the address to port 0x70, delay a little, and then write the value to port 0x71. A small delay of 1 microsecond (independent of CPU speed) can be achieved by writing to port 0x80 (the Power-On-Self-Test (POST) code debug port). You can find this source in by debug code git repo. Before you run this program, make sure you know which key should be pressed to jump into the BIOS settings on reboot (such as F2, delete, backspace,ESC, etc.) as some machines may just display a warning message on reboot and need you to press this key to progress further. Understanding PCI Interrupt Routing on the x86 platform is a not entirely straight forward. The underlining principle is determining which interrupt is being asserted when a PCI interrupt signal occurs. Unfortunately this is generally platform specific and so firmware tables of various types have been used over the many years to describe the routing configuration. While looking into the legacy PCI interrupt routing tables I found an excellent article by FreeBSD kernel hacker John Baldwin that explains PCI interrupt routing in a clear an succinct manner. Although written for FreeBSD, this article is contains a lot of Linux relevant information. My colleague Manoj Iyer has written up a guide on how to download EDK II and build the UEFI firmware for QEMU. This requires older versions of gcc found in Natty (since the newer Oneiric version is more pedantic and uses -Werror=unused-but-set-variable by default). With a chroot I was able get it downloaded, built and tested in less than 40 minutes. Here is a sample UEFI helloworld application running in QEMU using the firmware using Manoj's instructions. Now I can rig up some tests to exercise Ubuntu and the Firmware Test Suite without the need for any real UEFI hardware..
You can download the source here. 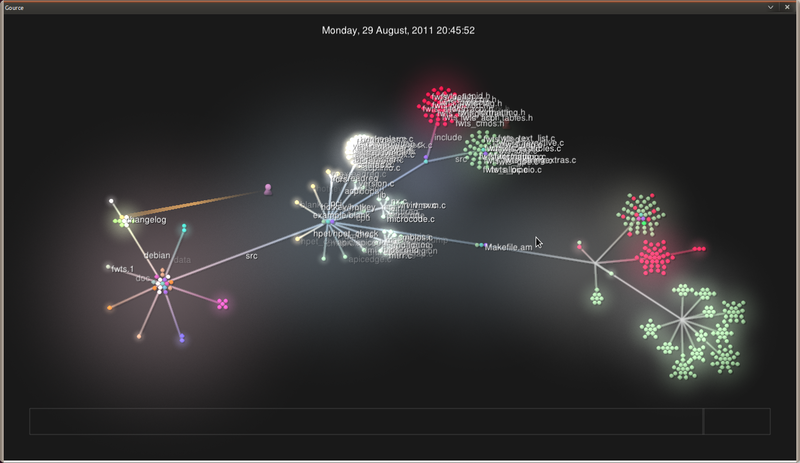 Today my colleague Chris Van Hoof pointed me to a Gource visualization of the work I've been doing on the Firmware Test Suite. 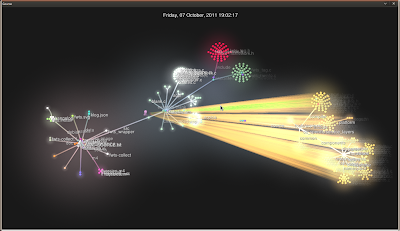 Gource animates the software development sources as a tree with the root in the centre of the display and directories as branches and source files as leaves. Static pictures do this no justice. I've uploaded an mp4 video of the entire software development history of fwts so you can see Gource in action. ..kudos to Chris for this rune. Proprietary Code - Where do we draw the line? I can't help being amused when users say they chose not to use a specific Open Source distribution because it contains binary drivers and hence is not totally free. I too really care that we have software freedom and try to work towards a totally free Operating System but where do we draw the line? Some users state that they won't touch a specific brand of hardware such as Wireless or Video because one has to use a binary driver or that it contains firmware that is not Open Source. While this is an admirable philosophical stance it has its blind-spots. For example, laptops contain Embedded Controllers to do a variety of hardware interfacing tasks - do we refuse to use these laptops because the firmware in the Embedded Controllers are not Open Source? Or how about the ACPI AML code that appears in the DSDT and SSDTs - so should we boot the machine with ACPI disabled because this code is not Open Source? Taking it further, what about the Microcode inside the processor? This binary blob is loaded by BIOS updated by the Operating System to fix subtle features in Microprocessors post-release. So, should we stop using this because Intel won't supply us the source? So at what point do we stop using a system because it is not fully Open Source? OK, so I've taking the argument to its logical conclusion to stretch the point. I fully understand that it is totally desirable to avoid using Closed Source binary blobs where possible and trying to keep a system totally Open Source keeps us honest. However, sometimes I find the purest viewpoint rather blinkered if it refuses to use a specific distribution when their machine is riddled with Closed Source binary firmware blobs. Perhaps they should start working on the BIOS vendors and Intel to release their code..